Eley Metrology has been providing granite surface plates and tables for over 20 years to the metrology industry. The expertise gained throughout these years have allowed Eley to reach a level of manufacturing excellence like no other. The granite plates and tables produced at our UKAS Laboratory (0333) are all hand-lapped by specialist engineers to the highest of tolerances. We pride ourselves on the quality of our granite surface tables, stands and meeting customer requirements. Custom granite support stands can be produced at Eley Metrology, to suit a surface plate above the size of 600mm x 600mm. It is not recommended that you mount a plate of the above size or smaller as it is liable to tip. This is due to the granite making it top heavy and therefore becomes a health and safety risk. 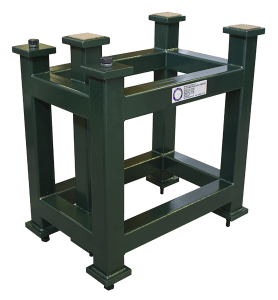 Our high-grade steel support stands can be produced alongside a granite plate to form a granite table or as a one off if you are moving from a large bench mounted plate to an area where the previous setup is not possible. Our stands give a working height of 34" (0.86m), and provides 5 adjustable points of support for easy levelling; 3 being primary points and 2 outriggers for stability. The welded box construction stand has extended use when panels and doors are in place. 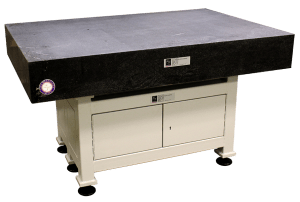 With the ability to store metrology tooling items such as vices or sine tables, or even small metrology standards such as v-blocks, your granite table and stand takes up the same amount of floor space but has more versatility. The main colours for the support cabinet chosen by Eley's customers are green, blue and white. We have the capability to spray cabinets in accordance with customer requirements as it may be a one-off piece of an exhibition or show, or for a demo room to store items under locks for security purposes. If you’d like more details about our range of Surface Tables Support Stands, then our team are available to help.